The types of works that many students and faculty would like to be able to include in scholarly works are not necessarily from other scholarly works. For example, scholars in my doctoral discipline of communication study a wide range of types of works including newspapers, television, films, cartoons, advertising, blogs and social media, and public relations materials. It is very useful for scholars to be able to include images and text from the primary source materials, either as illustration or for purposes of critique. Obtaining permission to use even small excerpts of such works is time-consuming at best. I argue that it would be in the best interests of scholarship to advocate for strong fair use / fair dealing exceptions for research and academic critique globally and accept that more restrictive licenses may be necessary to avoid the potential for re-use errors that could easily occur with blanket licenses allowing broad re-use. For example, while it makes sense to allow scholars to include small movie stills in an academic piece, it could be quite problematic for scholars to include such items in works that grant blanket commercial and re-use rights downstream. This illustrates what I see as one of the problems with the one size fits all CC-BY license preferred by some open access advocates (which I consider to be a serious error): what I interpret as an implicit assumption that all of the works scholars are likely to want to re-use are other scholarly works. Rather than making assumptions, let's do some research to find out what scholars and students would like to be able to re-use. Anecdotally, in my experience the most popular items for re-use are images from popular culture (especially characters from the Simpsons TV series), not scholarly works. Scholarly journals like to use photos to add interest and aesthetic value. If it is the case that the greatest interest in re-use for scholars involves works from popular culture / outside the academy, then ubiquitous CC-BY licenses for absolutely every scholarly article, book, and dataset in the whole world would not solve the primary re-use question for a majority of scholars. This is not meant to suggest that advocacy for global fair use / fair dealing rights for academic research and critique is an easy task, rather to raise the question of whether this is an appropriate and useful goal for scholarly works. This post is part of the Creative Commons and Open Access Critique series. Data for the first quarter of 2014 (the 11th year of publication of this series) are now available in the dataverse. Error note re Dec. 31, 2014 version: the number for Electronic Journals Library was copied incorrectly (total journals mistook for free full-text journals). Noted as an error in the current version, will result in under-reporting of growth of this initiative in the near future. 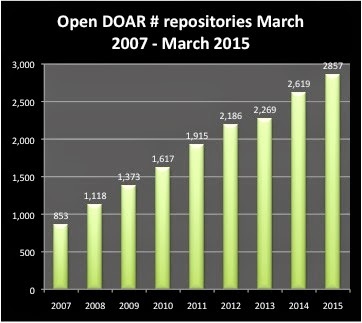 OpenDOAR added 129 repositories for a total of 2,857. The Bielefeld Academic Search Engine added close to 3 million documents for a total of over 71 million documents. Another 7,690 authors joined the Social Sciences Research Network for a total of over 275,000 authors. Internet Archive added 1.7 million texts for 7.8 million. 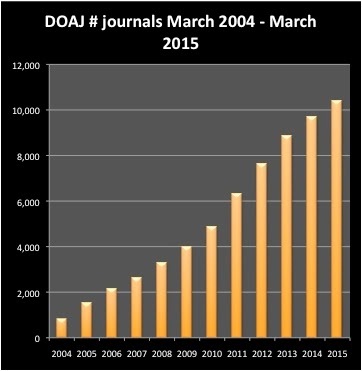 The Directory of Open Access Journals, in spite of vigorous weeding and re-organizing over the past year or so, is back to showing consistent strong growth, adding 254 titles this quarter for slightly under 3 titles per day. Over the past year, the growth in articles that can be retrieved through a DOAJ article-level search grew by over a quarter of a million articles for a total of over 1.8 million articles! 20 more publishers joined the Directory of Open Access Books - as of today, DOAB includes 100 publishers. Highwire Press added 9 completely free sites this quarter. The number of journals with immediate free access in PubMedCentral increased by 43 to a total of 1,443. Congratulations and thanks to all of the people and organizations working hard to make open access happen. This is a major step for every author signing up for a repository, every journal moving to immediate free. I wish I had the time to thank and celebrate each of your accomplishments individually.